Coming into Judo is hard. First, you have the lug the Judo gi all over the city throughout your commute. It takes up space in the office; it’s heavy, bulky, and inconvenient. Then you must bring it to the dojo along with your briefcase. After all that, you get slammed, fingers contorted, toes bent, leaving contused and confused. Now, with an even heavier gi (sweat infused) you must limp home…. I would be lying if I said Judo wasn’t hard and frustrating. The learning curve is quite steep. You can’t learn a technique and put it to use for a long time. It isn’t like taking a local kickboxing class where you learn to kick, hit the pads right away, feel good about yourself instantly and go home feeling like you’ve learned a skill you could put to immediate use. Do you remember the first time you ever picked up a basketball? I do. It wasn’t until very shortly after, that I was able to enjoy the pleasure of the ball swooshing through the hoop (I was hooked and dreamt of the NBA for most of my teens). 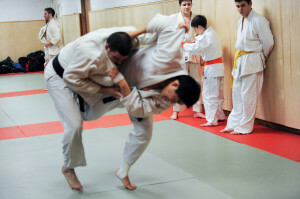 In judo, from the moment you grab a gi and learn your first arm throw, the time it takes where you can throw an unwilling participant takes a much longer time. Usually far longer than most people can keep interested. So yes it’s frustrating. Many people quit. Therefore it isn’t a very good business to be in. Unfortunately for me, my only other option is putting my Masters degree to use by working for the NYC DOE. Screaming kids, scolding administration, bureaucracy, taking orders? No thank you! For the many that come to Judo and have these frustrating feelings, it helps to know your purpose and set smaller goals. 6. Befriend the black belts!!! Everyone has a different reason why they seek out Judo instruction. Not everyone will be a National champion. If you have a clear cut purpose, it melts the frustration away since you are NOT comparing yourselves to the 10 year black belts, the World cup medalists and the Shintaro Higashis. Rather you are holding yourself accountable to the smaller goals that are set forth differentiated to your personal judo needs. Judo frustrated? Let it go!